Want To Buy The Best Baby Gates for Stairs? Here's an Affordable One! Baby Gates for Stairs Here: Comprehensive Guide & Advices! Home » Baby Gates for Stairs Here: Comprehensive Guide & Advices! How tall are the baby gates? How wide are baby gates? How to install baby gates on stairs, and how do baby gates attach? Are baby gates only for children up to 24 months? Guess what, you have a baby, and you have stairs too and guess what again, your baby loves to do dangerous activities, even extreme sports. Yup, all babies have this natural abandon to climb anything, anywhere, anytime, and they don’t give you know what about the consequences. Now, you have a few options, and these all include securing the stairs so that you can teach your baby how to climb them safely, as well as protect them from falling when near the top step. Now, I am not here to teach you how to raise your children, that is your job. 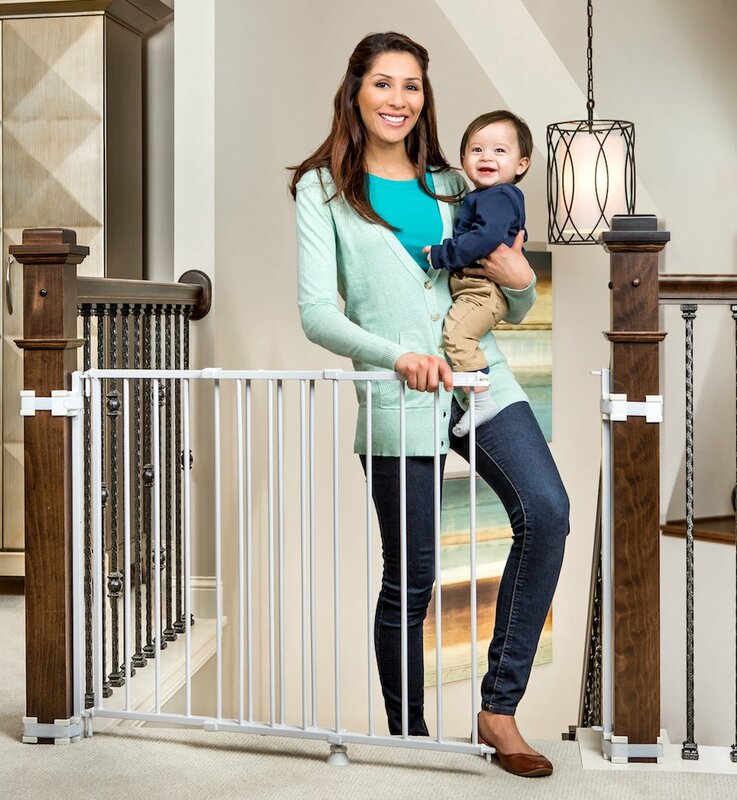 I am here to give you a review of the best baby gates for stairs, and this includes a list of the top ten best baby gates that I found and tested, including top of stairs baby gate that focus on a specific area, to a general individual baby gate with door option. Take note that the gates presented here are all suitable for top stair locations, some are designed specifically for this use, and others are more general (universal) in design. A secure steel white painted the top of the stair gate. 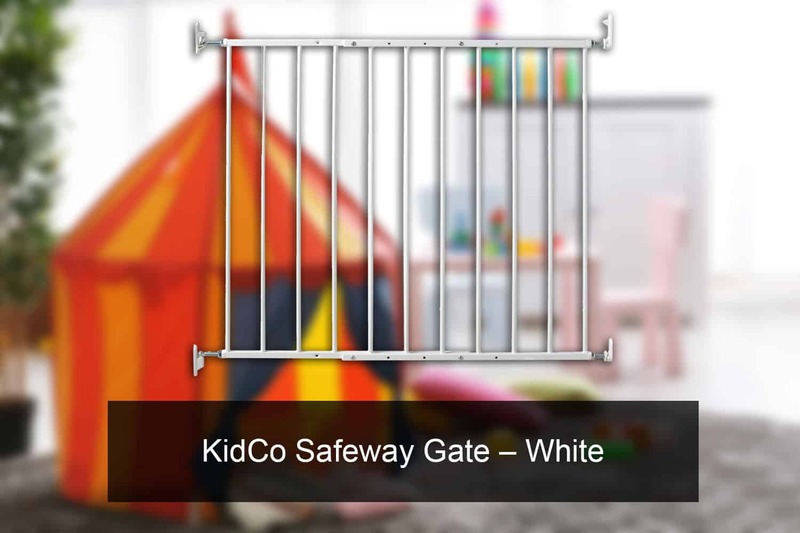 The KidCo® Safeway® baby safety gate is a gate that was engineered for the top of stair applications. This gate is exceptional and is made of a sturdy steel constructed frame. This model is very simple to install but does require you secure the hinge to the wall or a solid frame. The kit comes with a mounting template, and you will need to drill to install this securely. However, once this is in place, your baby and even children up to first walking ages will be secure. The paint is powder coat white gloss and is non-toxic, which is great for those babies that will chew on anything, anywhere and at any time. The release mechanism is very swift, so you don’t spend a lot of time messing around with the opening and closing of this baby gate. The Stairway Special Safety Gate SS-30 is the Cardinal Gates top model. 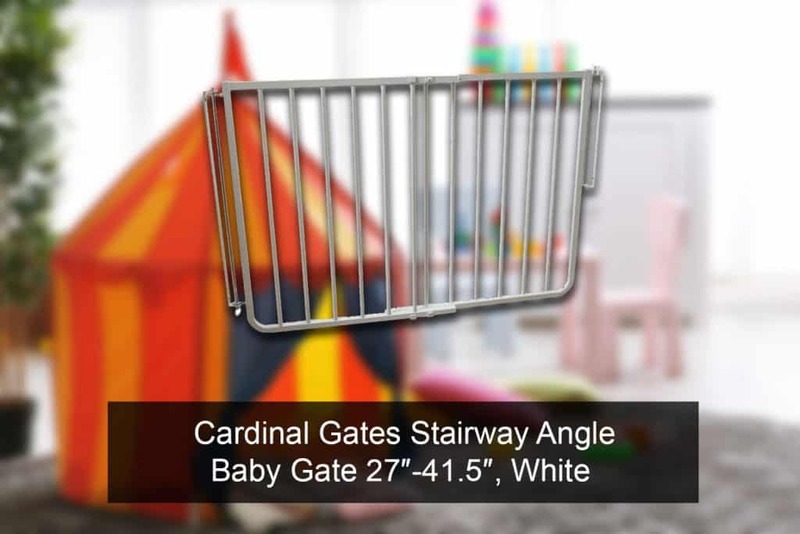 This extremely lightweight yet rugged and sturdy aluminum baby gate is a perfect solution for any stair location application. This frame comes with a long hinge mount that requires fastening to a wall or solid post. So, some drilling will be required to secure the fitment in place. This design allows you to install it up to an angle of 30o, which is great for many different stair designs. What is also exceptional with this model, is its versatility, allowing you to place it anywhere along the stairwell. This is an aluminum product, which means you get the strength to resist any child tampering, with the lightweight and corrosion resistance of a great alloy. This product is finished in a powder coated paint, that is non-toxic and long-lasting, and comes in a choice of black or white. The opening mechanism is simple, freeing one arm to hold the baby, while the other can easily open and close the gate during use. One way opening to secure against swinging over a top staircase. 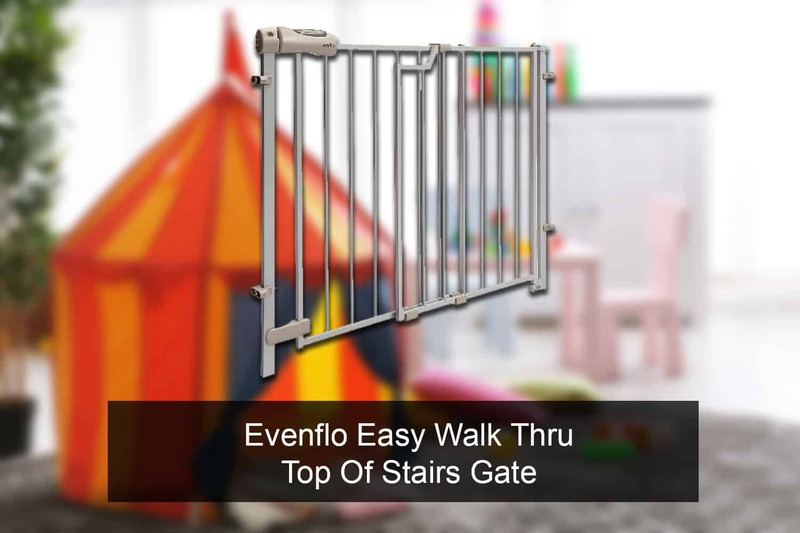 The Evenflo Secure Step Top of Stairs Gate is a product designed specifically for placement at the top of stairs. 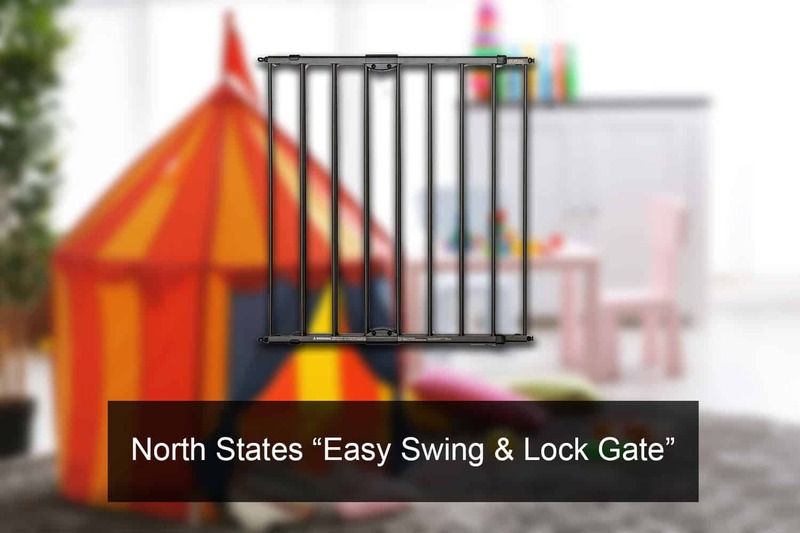 This gate has wall mounts that require securing onto a wall; you can set the direction fo the swing, to pen inwards, providing extra security against forgotten unlocked gates. The handle is an easy glide design, that is child proof and allows you to open it with one hand while holding your child on the other arm. As stated, you will need to drill holes to attach the fitments. This model comes in two colors, white, and wood. 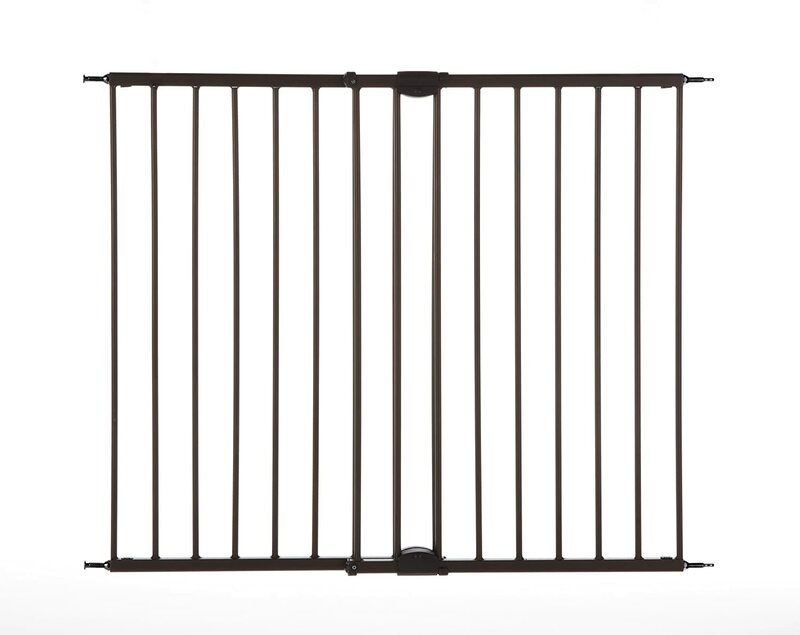 The overall size is adjustable, and you can expand this gate from a width of 29” to 42”, and is 30” tall, so when secured at the height of 3”, you get a total protective barrier that is 33” high. 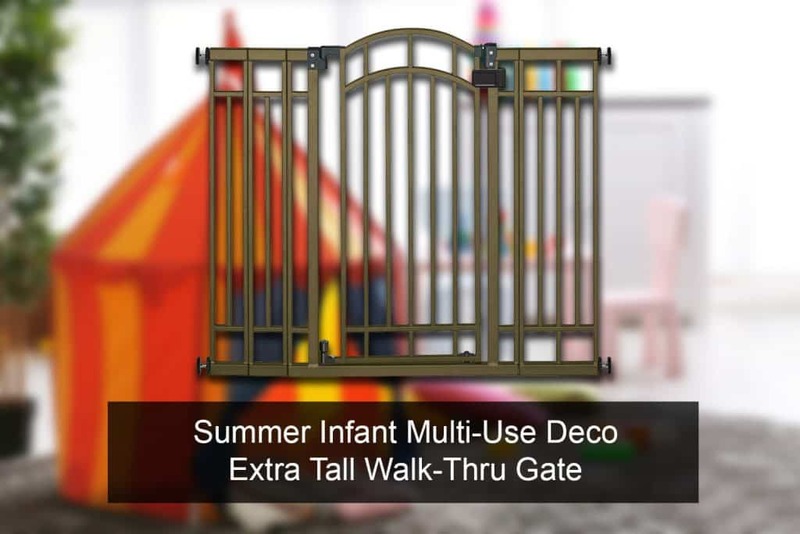 Multi-purpose child security gate made of steel The Easy Swing and Lock Gate are steel, multi-purpose gate that can be located anywhere that fits the gates frame dimensions. 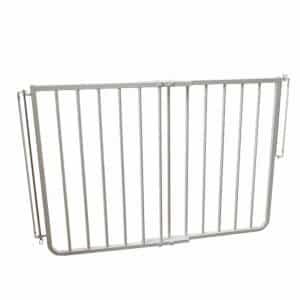 This is a steel gate; it is designed for high traffic and use by people of many ages. The frame comes with a solid hinge fitment that requires drilling to secure it in place. The opening mechanism requires one hand but is designed for adult use, so it is impervious to young children’s tampering. This gate is an exceptional stair, hallway and general barrier for use with babies between 6 months and two years old, as well as perfect for securing the pets from wandering into places you want pet free. Easy to install, ready to use, top of the stair child safety gate. 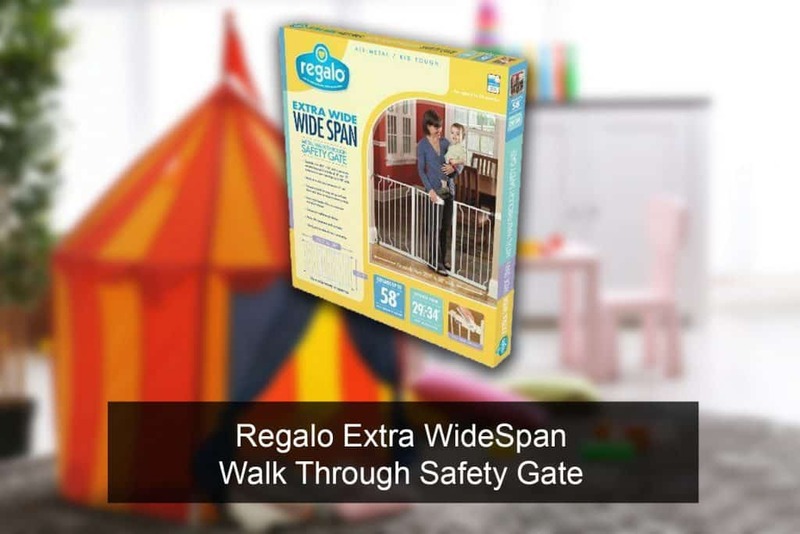 The Regalo is one of my favorite gates, for the simple reason that you don’t need to drill into walls to secure it. The hinge fitments take into account that some stairs do not have walls on both sides, and as such are secured with fastening bracket that can fit around a post. This type of hinge attachment is extremely reliable (from personal experience) and since this is a steel construct, is actually harder to bend then aluminum, which is sometimes the case youngsters (not babies) use the gate too. The latch is lever operated, making this a very easy system to open and close, and then again, the banister mounting system is not to be overlooked, it is extremely useful and reliable, even while you get a full wall mounting hardware option with this kit. 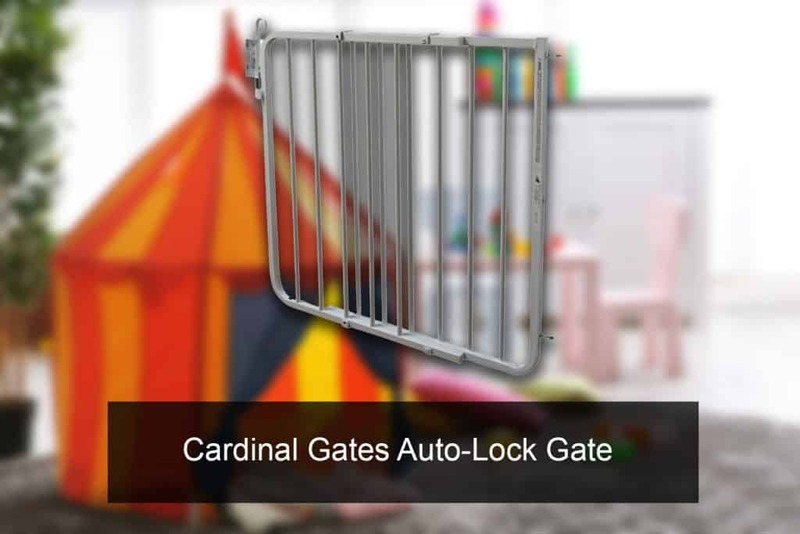 Auto-locking steel baby safety gate The Auto-Lock Gate # MG-15 is another fine Cardinal Gates product, and I will be reviewing more from this company since they provide a wide range of products and applications. This model comes with an auto-lock feature, hence the name. This is easy to use an opening mechanism that is hands-free after opening it, you just swing the gate back, and it locks automatically. This model is made of aluminum and painted in a non-toxic powder coat. This is a fixed hinge model that requires drilling the steel hinge and locking plates into a wall or post. This is a versatile model; you can place this model at the top of a staircase, or at the bottom. 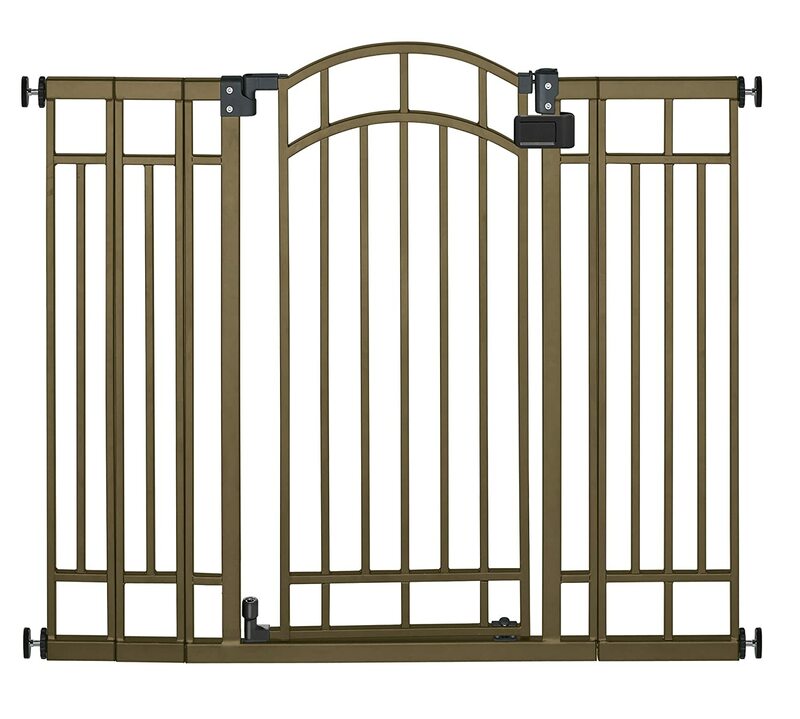 Multipurpose pressure mounted gate The North States has a number of models that are all bespoke; this is their Easy-Close Gate. This model is a pressure mounted model, which means you don’t need to drill anything. However, a pressure mounted gate mechanism has its drawbacks. You need a flat surface to place the legs, and you need to secure it and occasionally tighten it into place after a few weeks of heavy use. On the upside, this is a very easy gate to install, remove and install again. 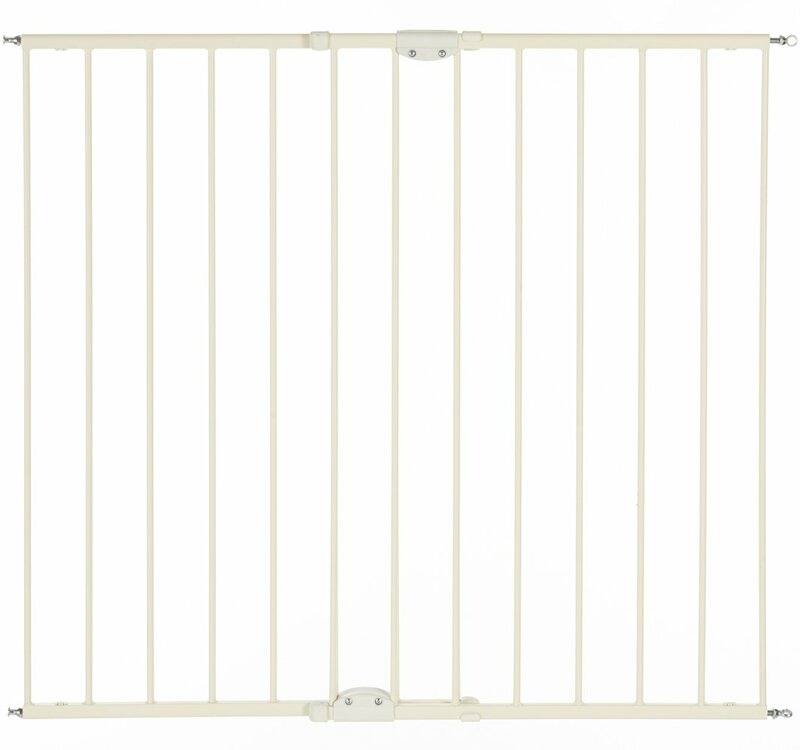 This gate can be placed anywhere that the frame will lock into place. As such, it provides a perfect solution for more than stair safety and can be used to secure entire passages, and rooms, from children and pets. Fixed location, easy to use tall child safety gate This is another North States model, and this one us a fixed gate, so you need to drill some holes to secure the fitments in place. 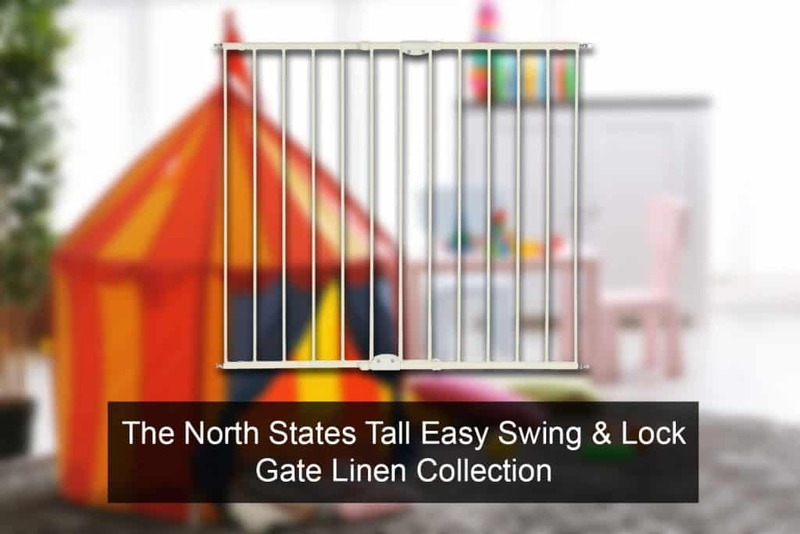 As with all North States models, this is a steel gate, providing you with extra security and strength. 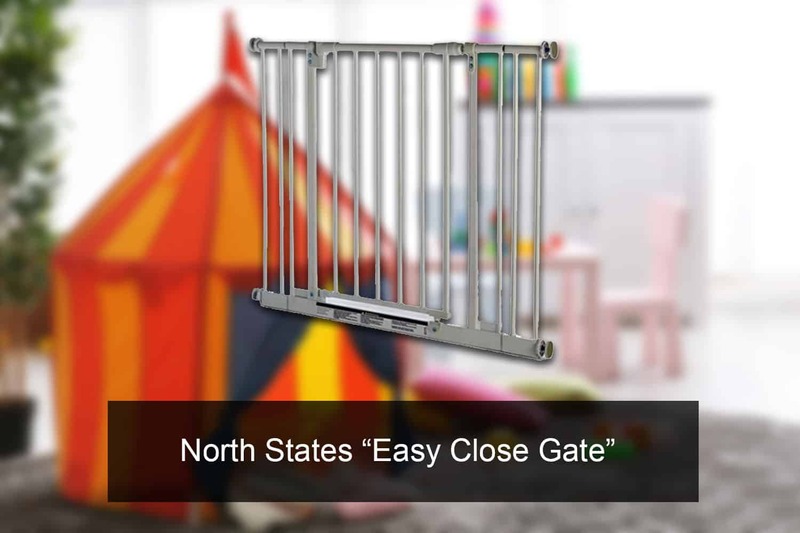 The gate mechanism is easy to open and incorporates the standard North States self-closing mechanism. 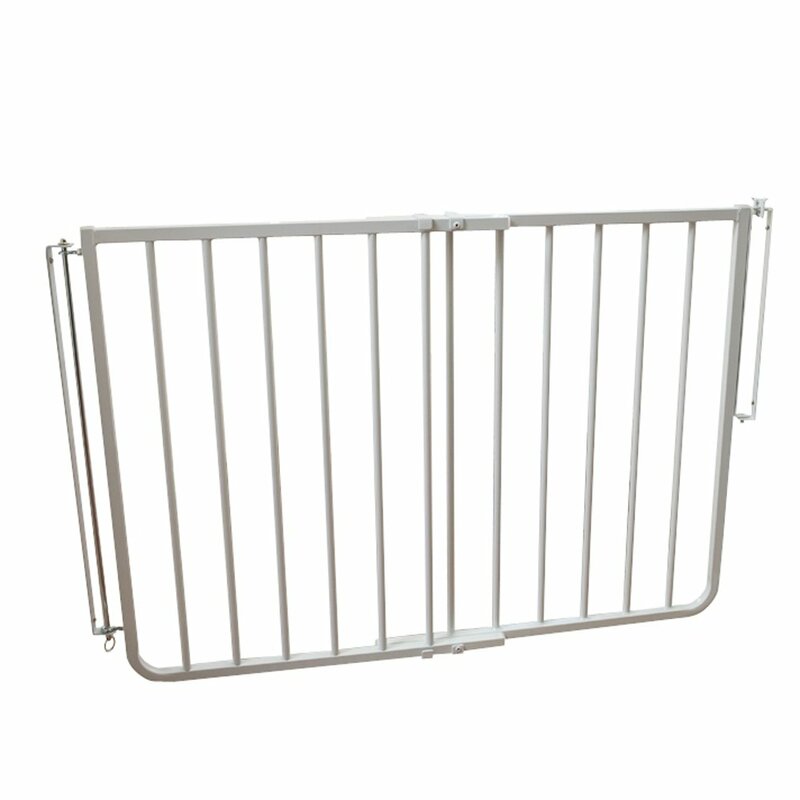 This model is higher than the standard models and is 36” high, which means that when setting to 3” installation height, the gate reaches an additional 9” of height above standard gates. Multiple extension pressure and fixed mounting baby security gates This is the Regalo Extra wide gate, which means it’s the same Regalo as the previous model I reviewed here but comes with three extra extensions, so you can set up an extremely wide gate where the dimensions of yore steps are not standard. This kit comes with both pressure mounts and fixed wall mounting hardware. You can even use both, and since this is an extremely wide gate, it can be used for passageways, and wide room entrances. A classic design with a bronze finish, a stylish baby safety gate If you are not interested in a “common” white gate, then you need an upmarket, stylish bronze gate. This one is designed to fit into eclectic and classic designed homes that want to retain their design features without compromising the beauty of their homes interior design. 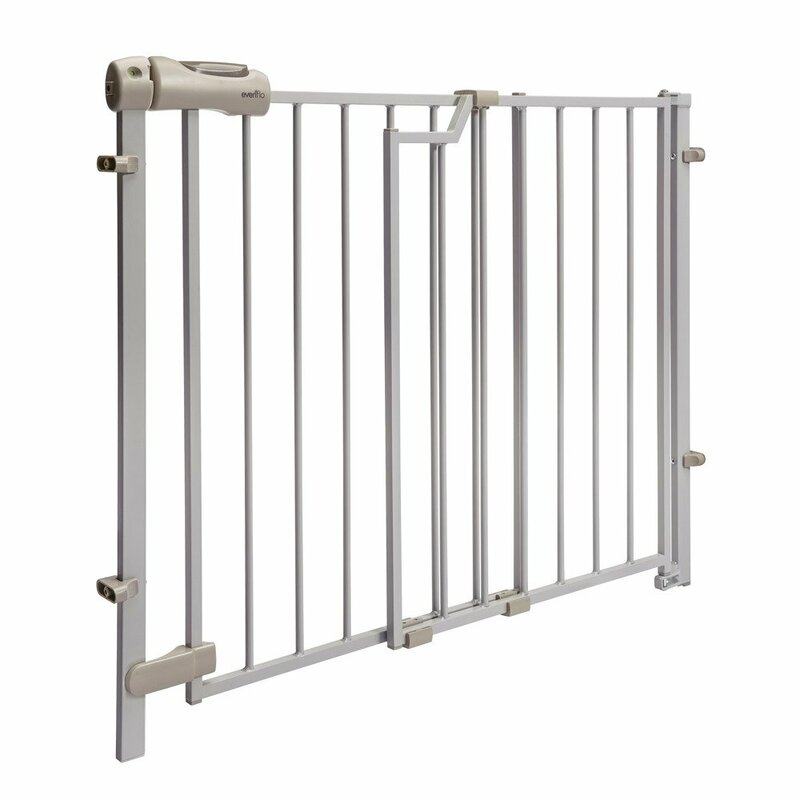 This model goes beyond design; it features a dual locking, auto-close walk mechanism, so you can open the gate and leave it to close automatically. The mounting mechanism is pressure, and it comes with optional fixed mounting hardware. However, the designers understand that some homes don’t want to damage the walls with unnecessary holes, and the pressure mechanism is engineered to fit in effortlessly into place. It also comes with a special banister mounting kit as well, since not all homes have walls on both sides of the stairs. The bottom line is that this is a beautiful interior decorated design that delivers both functionality and design in one. Baby gates come ins a standard size. However, there are occasional exceptions to this rule, so some gates might come with higher standards for additional functionality. Having stated this, the basic standard height is around 30”, but must not be less than 22”. Take into account the mounting height should not be more than 3” from the ground, and add the gate height to reach your final height. 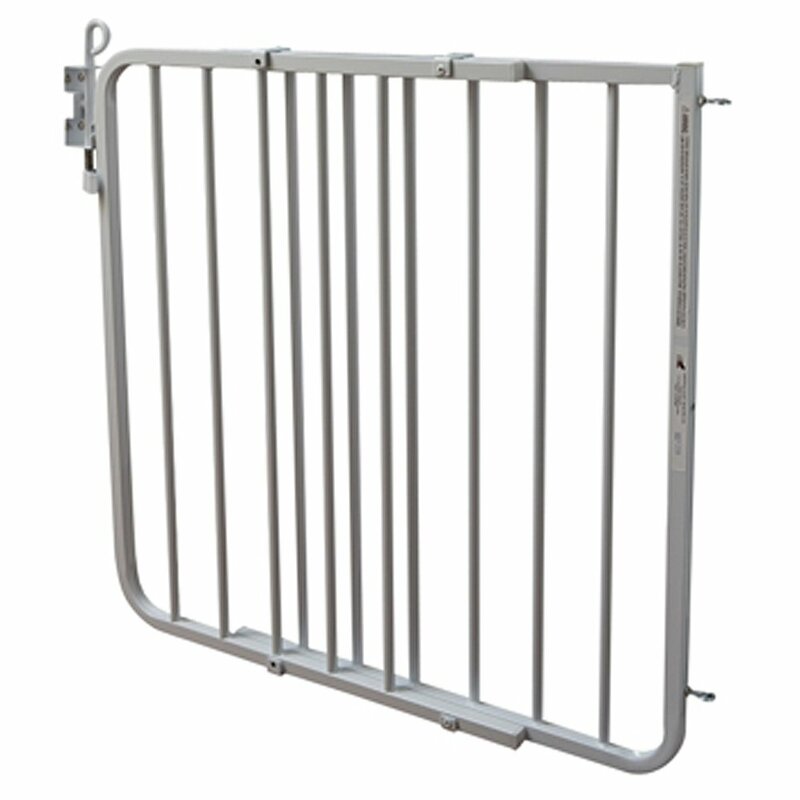 Since most gates come with a 24” to 30” height, you will always be secure over the minimum requirement. 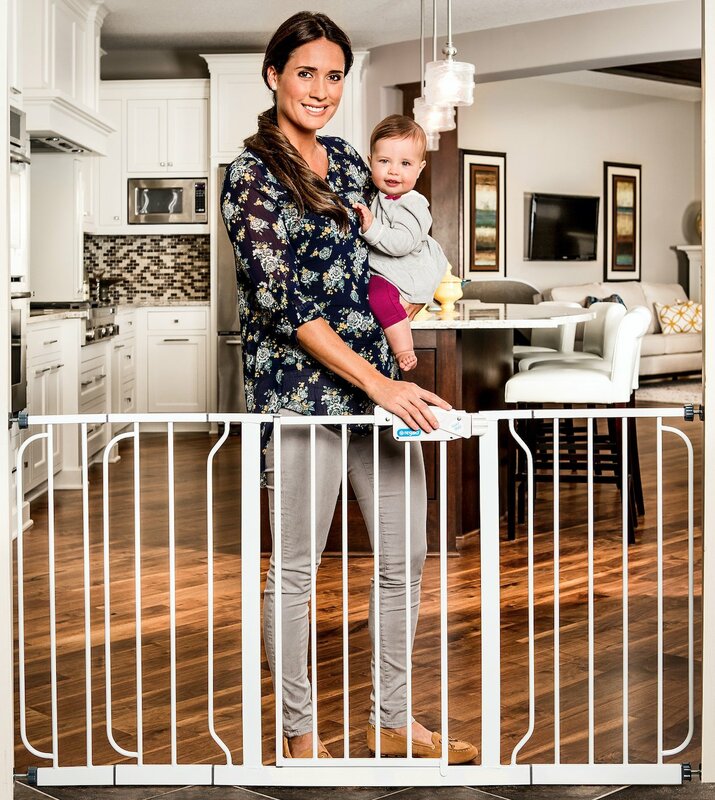 Baby gates come in all kinds of widths but are generally expected to fit standard stairwell sizes, so they do not come less than 28” wide. 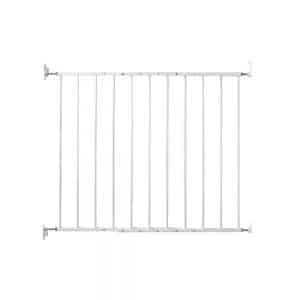 Since some locations have different widths, most of the best gate manufacturers provide an adjustable gate width that will let you widen the gate up to 48”. There are extra wide gate dimensions and extensions for whole rooms. When you measure the width, make sure the baby gate frame with the fitments or pressure bolts are the width you adjust to. Otherwise, you will find you bought a gate that is too wide to fit into the location you want. 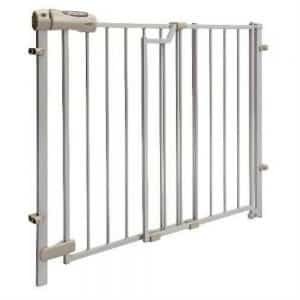 There are a number of baby gate types, and each one installs in a different manner and works using a different mechanism, so here goes: Hardware-mounted or permanent/fixed gate A fixed gate uses hardware mounts to fix bot hinges and locking mechanisms to the wall or posts. These hardware parts are made of various materials, but the better ones are made of metal. They fix onto the wall using screws, so you are expected to drill holes to fix these into place. Hence the category name permanent. These are used either at the head of the stairwell or at the bottom and are not usually found in other application locations. Take into account the direction of the gates swing, some are bi-directional, and others only have one direction. Whichever you pick, make sure the gate swings inwards towards the room and not the stairwell. This is of primary importance since sometimes gates can be unlocked, or be unlocked by youngsters, and when someone leans against them, he or she will fall outwards onto the stairwell. These are the best and most secure gates for top of the stair applications, and their materials vary between wood, metal, and plastic. Installation: Locate the place you intend to secure the gate, drill the appropriate number of holes into the wall for the hinge mounts and locking mounts. Make sure the gate is aligned, so you drill the fitments in equal horizontal and vertical placement for a secure and smooth opening. Bannister Straps These are used when pressure is not possible, and you don’t want to damage the wooden or metal post with drilling. These are secured straps that firmly adjust the frame to a banister. These are exceptionally useful in an application with a fixed mount placed on a wall. Pressure-mounted gate These types of gates use pressure from “pressing” the gate frame to the wall. This is done by using a “one construction“ frame, which is connected in one piece from side to side. Only the entrance area is free of a horizontal bar. The pressure bar, which is usually placed on the floor (obviously) is secured against the wall by four pressure plates. These are adjusted into place using a screwing mechanism that you turn until the right amount of pressure secures the gate frame into place. 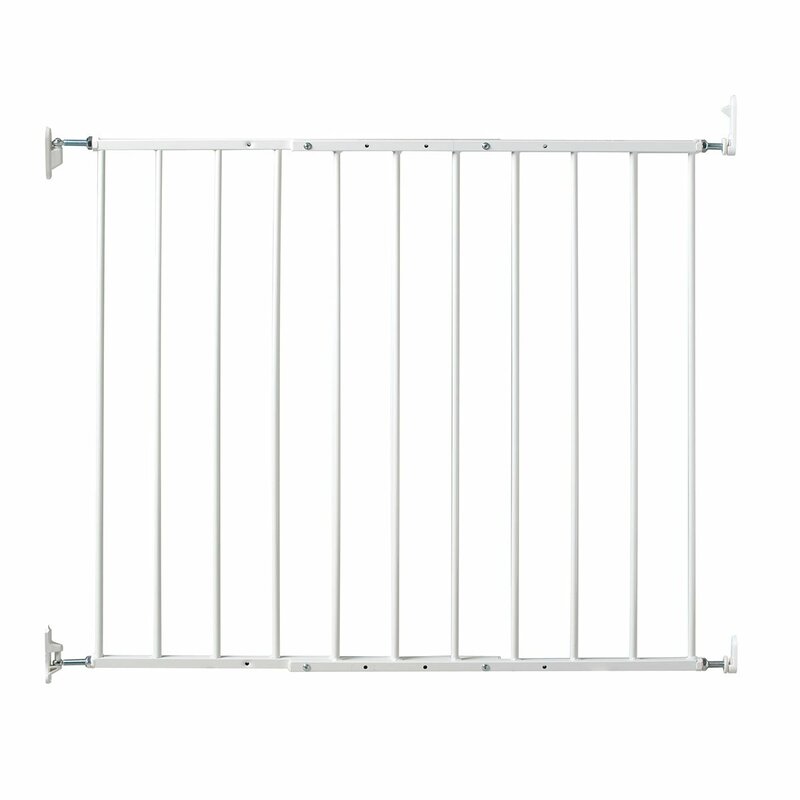 Pressure mounted gates come in all kinds of materials, and the upside of these fastening systems is that they do not require drilling. Since they are less secure than fixed gates, they are not recommended for top of the stair applications, however, if you have no alternative then just make sure you check the integrity of the gates status weekly. These units can be easily placed in doorways, the bottom of stairwells and in passages and corridors. They are a great feature for children and pets and can be used to cordon off any part of the home, and since they are easily installed and mobile, you can move them around for different requirements. Installation: Simply find a suitable location that holds the width of the gates frame with about half an inch to spare on either side, then start to turn the pressure mounting mechanism until the frame is secure. Once you have secured it into place, you then turn the mechanism until it is fixed tightly and cannot be moved by anyone but an adult. Essentially yes, and also no. 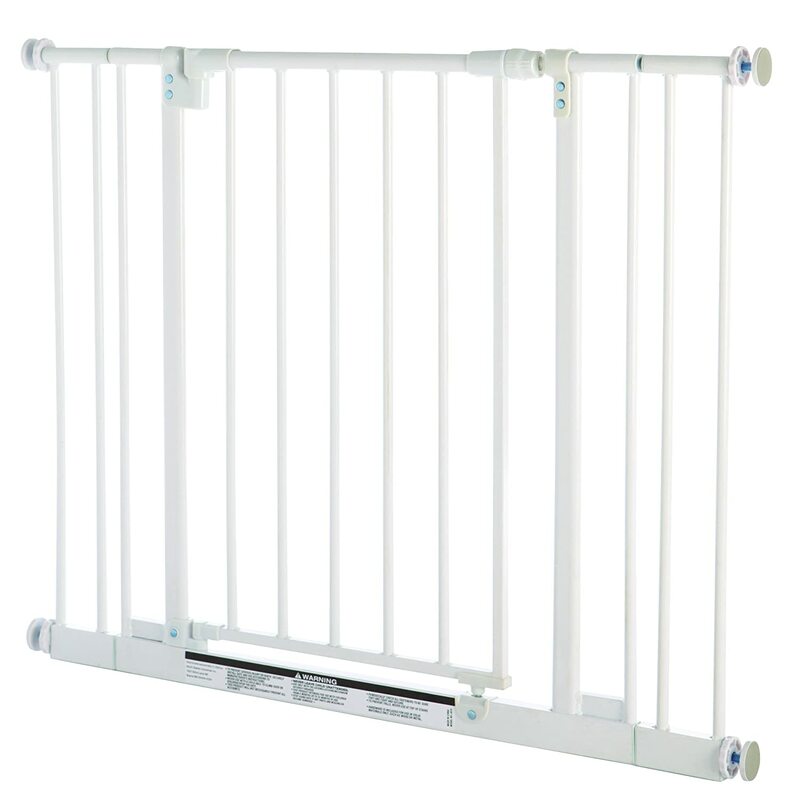 Baby gates can be used to secure locations against pets as well as babies. The age is set at 24 months, since most children at that age can both reach the gates locking mechanism and, in many instances, operate it easily. 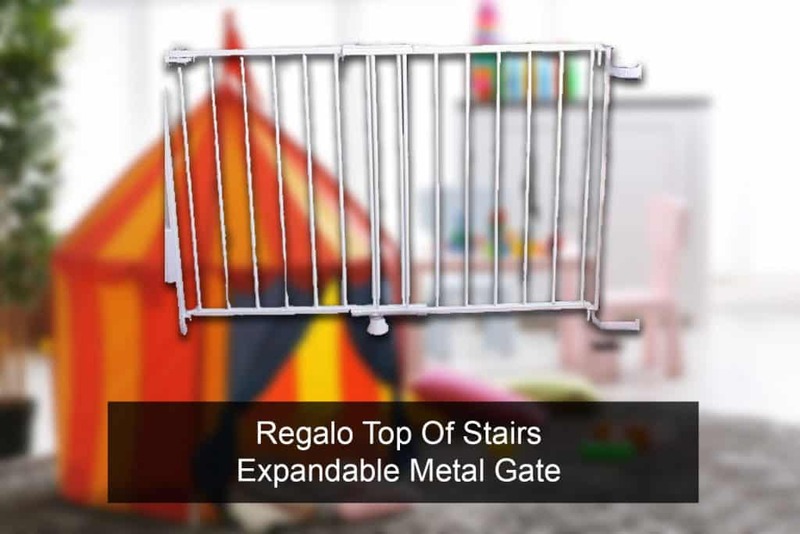 Another reason that gates are not used over this age, is that older children, like adults can climb down stairs, and the only security they offer is a barrier when children run around, which this will do till they grow up to adulthood, as such, a baby gate looses its effectivity after the age of 24 months. Some posts may contain affiliate links. HomeCareChoices.org is a participant in the Amazon Services LLC Associates Program, an affiliate advertising program designed to provide a means for sites to earn advertising fees by advertising and linking to Amazon.com. My name is Damian Williams, a home security enthusiast, who loves modern technologies, prepping, surviving, electronics, etc. Running HomeCareChoices to share unbiased guides, reviews and solutions.